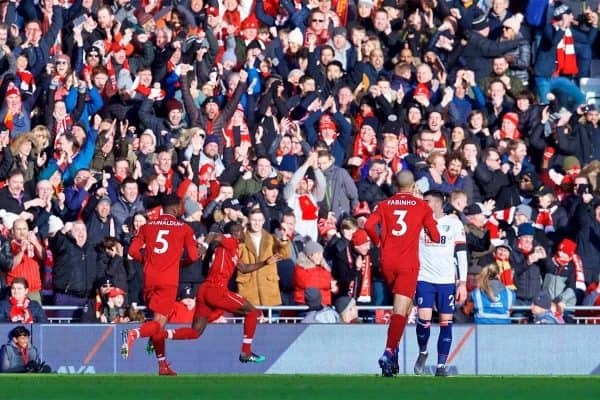 The media thought Liverpool produced their best display of 2019 in the 3-0 win over Bournemouth and praised the Reds for bouncing back strongly. There was no sign of nerves as Jurgen Klopp’s side marched past the Cherries and back into top spot of the Premier League. Sadio Mane headed home to open the scoring with his fourth goal in as many games, before a sensational lob from Gini Wijnaldum gave the Reds a cushion. Mohamed Salah’s cool finish wrapped up victory after half-time and Liverpool could – and should – have gone on to knock up a cricket score. 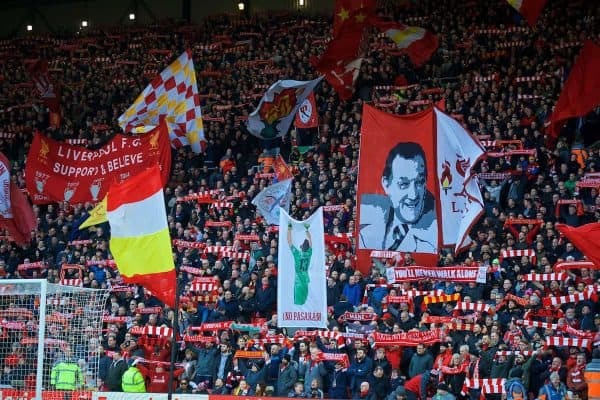 It was a great performance nonetheless and Klopp will be delighted with the efforts of his players and the Anfield crowd, who delivered on calls for a big atmosphere. Here’s what the media made of the victory. This sparkling performance – packed with quality, pace, hunger and passion – made a mockery of claims that either the manager or his players are crumbling under the pressure. This felt like a statement performance and a statement victory. Yet this was their best display of 2019 so far and it probably matters because they look convincing again. 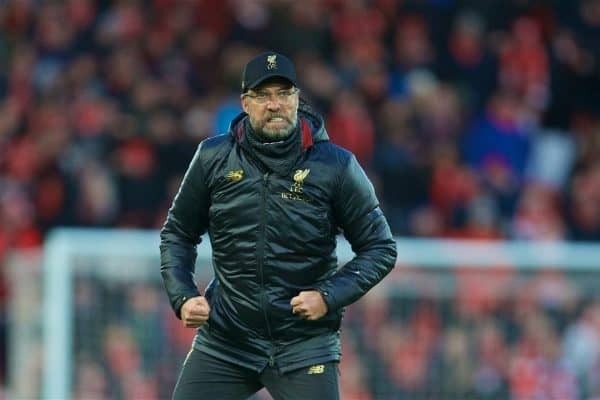 This was Jurgen Klopp hitting all the right notes of his heavy metal football: controlled yet rapid changes of tempo to dislocate the opposition. Just as importantly, they looked back to their old selves in dispatching Bournemouth at Anfield. The manner of the performance bore all the hallmarks of a side that hasn’t lost any of the belief that has now seen them negotiate 26 Premier League games with only one defeat. Klopp revisited the recent past, reverted to 4-3-3 and his players looked liberated as they played with more speed and intensity. Liverpool’s pressing was much sharper, as was their ability to break down a congested and narrow opposition. 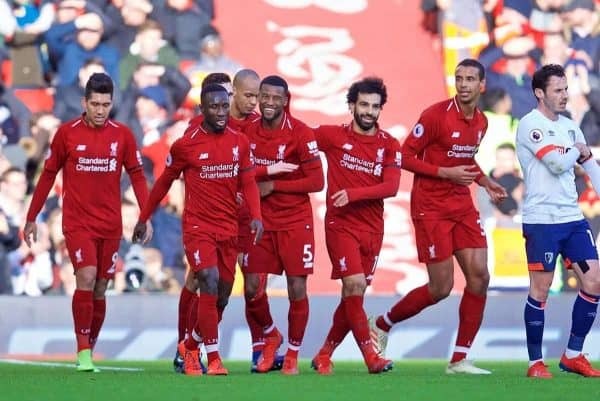 But the crispness of the Reds’ play – once again employing a 4-3-3 formation – the effectiveness of the pressing and the combinations up top would have been difficult for any team to handle. City can regain the leadership by beating Chelsea on Sunday but Liverpool will then have a game in hand, a rest until the Champions League resumes with the visit of Bayern Munich and the knowledge that they can still overwhelm opponents when the need arises. Returning to the lineup at Anfield on Saturday, the Dutchman showcased his importance and his ability once more. Effectively playing as the right-sided of two No. 8s in a midfield three, Gini was a constant runner from deep into the channels, constantly looking to link with the front three and getting himself into the penalty area more often than the central players have of late. 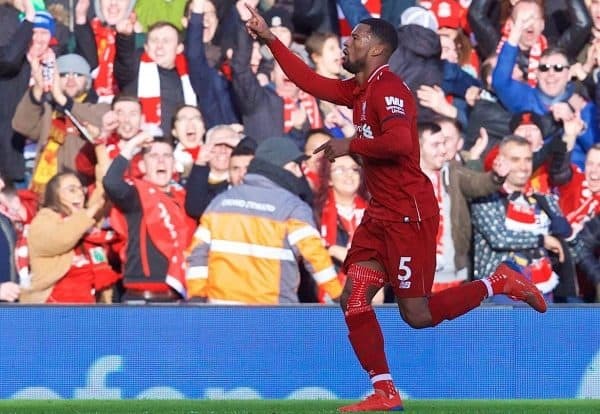 This season, Wijnaldum has established himself as the man who makes Liverpool tick in the middle of the park courtesy of a potent mix of positional nous, vision, and patience in possession. The Reds desperately need his latest injury lay-off to be the last of 2018-19 if they are to win the title. With his energy, runs off the ball and technical capabilities, it was back to the old Liverpool with the 28-year-old keeping the attacking carousel moving […] There is a reason Klopp picks Wijnaldum more regularly than any other Liverpool midfield. Like Fernandinho at Manchester City, he is irreplaceable and the ovation he received when he was replaced by Klopp 14 minutes from the end was fit for a hero. Following on from a massively improved second-half showing in the capital, Keita was in fine form here, and his confidence only seemed to grow as the hosts added goals. Thankfully, it now appears that the former RB Leipzig man is starting to live up to the high expectations, even if patience is still likely to be required at times. The title is still in their hands, and Liverpool may have emerged from a rough patch of the season with 11 points from a possible 18. After a couple of below-par games from Salah, Sadio Mane and Roberto Firmino, all three were very much impressive and excellent at Anfield on Saturday. The pace of the game was better thanks to their movement and ability to play off each other, tearing Bournemouth‘s defence apart with increasing regularity. It was selfless as well as mesmerising for most of the 90 minutes, though, which bodes well for a return to top form heading into the crucial final third of the season. That strike meant the Senegal star has now scored in four successive Premier League games for the first time in his career. With a dozen league goals, he is now level with Eden Hazard and closing on Harry Kane, Sergio Aguero and Pierre-Emerick Aubameyang. That’s some going. Salah has been Liverpool’s headline-grabber over the past 18 months, but Mane’s consistency, and his importance to this title challenge, must not be underestimated. Jurgen Klopp paid tribute to supporters’ group Spion Kop 1906 in his programme notes and rightly so. They had taken a stand against the negativity which had seeped in following the insipid draws against Leicester and West Ham. They had mobilised a fanbase to show up early and make a difference. The volume levels throughout were more akin to a big European night. Here was the power of Anfield.